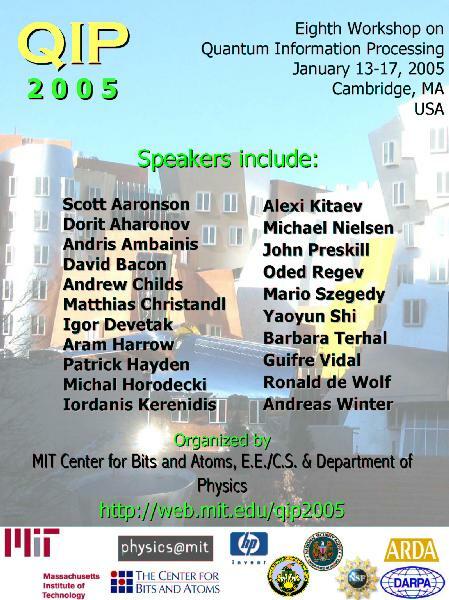 To be held at MIT in Cambridge, Massachusetts (USA); hosted by the quantum information science groups in the Center for Bits and Atoms and the Department of Physics. Quantum information processing is the recasting of computer science in a quantum mechanical framework. It improves on classical computers and classical complexity bounds by making use of quantum mechanical phenomena. After Peter Shor's 1994 discovery of efficient quantum algorithms for factoring and the discrete log (threatening current "classical" cryptography), the field has grown explosively and is now one of the most active subfields of both computer science and physics. QIP 2005 is the eighth workshop on theoretical aspects of quantum computing, quantum cryptography, and quantum information theory in a series which started in Aarhus in 1998 and was held last year at the Perimeter Institute in Waterloo. The conference will run from Thursday 13 January until Monday 17 January. It will consist of various invited talks, a display of posters, and an open session. Co-organizers: Isaac Chuang, Edward Farhi, and Peter Shor.